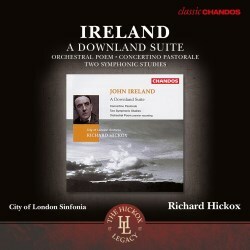 John Ireland wrote his Downland Suite in 1932 for the National Brass Band Championship of Great Britain at a time when original pieces were regularly commissioned for major contests. It is dedicated to Kenneth Wright and the winning band at the work’s debut was the Fodens Motor Works Band conducted by Fred Mortimer. The suite, pastoral in nature, was inspired by the Sussex countryside and in its arrangement for string orchestra it is a gem of the British string music repertoire. The two central movements - a tuneful Minuet and the absolutely magical Elegy - are the suite’s highlights. This is English romantic music at its very best. The second work for string orchestra featured on the disc, the Concertino Pastorale, is a somewhat more serious work when compared to the Downland Suite. The music is more dark and melancholy, especially in the central Thredony which probably reflects the more pessimistic mood of England in 1939. The final Toccata is somewhat more optimistic with its bustling rhythms and forward momentum. The Orchestral Poem is romantic piece lasting for just over 13 minutes. I was written when the composer was aged 24. The CD booklet refers to the influence of Brahms and Stanford and that is a fair summary. It’s a well-constructed, atmospheric piece that demonstrates a clear mastery of the orchestra. Although no massive claims can be made for it I was very pleased to have come across it for the first time. The Two Symphonic Studies, arranged by Geoffrey Bush, are taken from the music written for the film The Overlanders. The opening Fugue is dramatic and exciting. The Toccata that follows is a menacing romp of a movement that indeed sounds like film music. Richard Hickox and the City of London Sinfonia play brilliantly throughout and the sound is a typical Chandos production offering warmth, depth and a sense of spectacle.